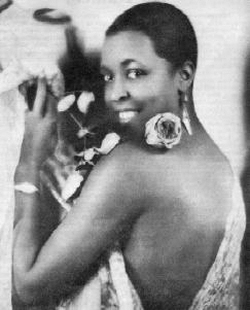 In 1950, Ethel Waters was the first black American performer to star in her own regular television show, Beulah, but it was the 1961 role in the “Good Night, Sweet Blues” episode of the television series Route 66 that earned her an Emmy award. She was the first black so honored. Acting was a second career after singing in four different genres – jazz, blues, pop, and gospel. She performed on Broadway stages, the first black to receive top billing with white stars. And finally, she claimed leading roles in Hollywood films, earning an Academy Award nomination for the film Pinky. Born on October 31, 1896, Waters won a talent contest as a teenager and began to sing around the Philadelphia area after growing up in Chester, Pennsylvania, where she sang in the church choir, and worked as a domestic. Her first professional tour, with the Black Swan Troubadours, taught her to incorporate excitement and versatility in her vaudeville act. Her divine discontent with just jazz and the blues propelled her into acting. In 1938, she gave a recital at Carnegie Hall and then began to appear in dramatic roles. She performed in Cabin in the Sky in 1943 and followed that film with more than ten others along with a treasure trove of classic songs including Am I Blue?, Memories of You, Stormy Weather, Porgy, Georgia on My Mind, and I Can’t Give You Anything but Love. Ethel Waters even conquered the publishing world, producing two autobiographies: His Eye is on the Sparrow and To Me It’s Wonderful. Her personal life included three marriages. Prior to her death in Chatsworth, California, on 1 September 1977, she had come full circle, once again singing in the church. She worked with evangelist Billy Graham while still performing the occasional concert.